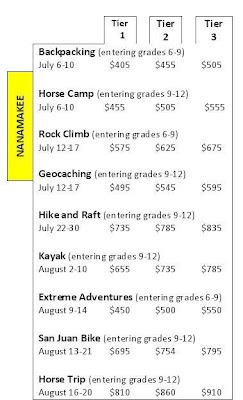 Nanamakee Expeditions open the door to some of the Northwest’s most spectacular natural beauty. Lasting friendships, adventures, and a stronger connection to God await you. All trips are led by trained and experienced leaders. While tripping experience isn’t necessary, participants must be in good physical condition and prepared for some strenuous activity. CLICK ON THE SCHEDULE FOR A CLOSER LOOK AT PRICES AND DATES! Reach new heights in this adrenaline pumping adventure. Start off on our rock wall and learn basic climbing techniques with our knowledgeable staff. Next, move onto real rock with the help of expert guides. Wrap up the trip with a day hike up a local peak. Spend the week on a high tech treasure hunt. We’ll use GPS units to join in the fun of this new outdoor adventure. Come join us for a spectacular backpacking adventure in the North Cascades. We’ll see unforgettable sights, wildlife, and great views of mountain valleys. You’ll spend one day rafting the Skagit River. Participants should be in good physical condition and able to travel 6-9 miles a day carrying a 35-40 lb pack. Paddle the stunning south Puget Sound in kayaks. Follow the tides through the sound while learning basic camping and water skills. Intermediate swimming ability is required for all water trips (swim 100 yards, tread water for one minute). Heart pounding adventures await you as you rock climb, challenge yourself on our vertical playpen, and new high ropes course. Leave camp for a night of camping and rafting to finish the trip. Explore the hidden beauty of the San Juan Islands. Ride through seaside towns and historic fishing villages as you discover the magic of these islands from the seat of a bicycle. We’ll ferry between islands to find beautiful sites seldom seen from speeding cars. This is a beginning-to-intermediate level ride with plenty of time to explore. Starting out with a day of trail riding at camp, then we’re off to the high mountain meadows for four days on horseback. Ride 8-12 miles a day, stopping to swim and relax while enjoying the scenery. Our host is Icicle Outfitters with great food, gentle horses, beautiful lakes, and flower-filled meadows. Horse camp doesn’t end at 9th grade anymore. Come back to Hamilton to this unique experience of community, friendship and horses. Spend the majority of your day riding and learning advanced horse care. At night we’ll have our own camper led campfire under the stars at spirit wood.